Tropical island dream, a slice of paradise! 9/42: Walkway to the beach, just 50 paces to the calm waters of West Bay Beach. 14/42: Gas grill - gas included. 18/42: Open plan living space with large dining table, bar fridge and lots of space. 19/42: Our beach West Bay. 33/42: Living room with Wi-fi & local cable T.V. New remodel of the living room and kitchen, including new floor tile, kitchen cabinets and appliances, and all new mattresses! Barefoot Dream Beach Level is a great spot for two couples or a small family. The spacious, covered front deck greets guests. There is an outdoor dining table with seating for 6, and a hammock for those lazy afternoons or evenings. In front of the deck is a lush garden area where guests can enjoy the use of a charcoal grill to cook up that day’s catch. Inside the home is an open floor plan with another dining table for 6 and a comfortable living area with cable TV, DVD player and music docking station. The kitchen is very well equipped with everything you’d need to cook for your group, as well as an extra mini fridge for your cold drinks. There are plenty of screened windows to take advantage of the cool island breezes, but the space is also air conditioned if you prefer. There are two bedrooms and two bathrooms. The first bedroom has two twin beds that can be made up into a king bed should guests require. Directly across the hall is the shared bathroom, with its large, tiled shower. The master bedroom boasts a 4-poster king bed and en-suite bath, also with a large, tiled shower. Barefoot Dream Beach Level is located in the sanctuary of West Bay Village, a cozy collection of 8 Caribbean-style homes located right on West Bay Beach. Each home is private in its own space, yet close enough to your neighbor to make it easy for a quick visit. This area is popular with groups due to this convenient and private arrangement of the homes. There is a beach area that offers all WBV guests beach loungers and a marked swim area. The entire team was great. Specially Shanna who responded very quickly to all my questions and did a very clean check in process. Everything that was requested was arrange and didnt have any issues. The property itself is amazing. New renovated kitchen with all the proper kitchen utensils. Bedrooms and bathrooms were great! Big living space and great outdoor patio! I highly recommend this property for a west bay visiting! REPLY: Thank you very much, the owners are very proud of the updates (as are we!). We always happy to have you back, see you next time. The team at Island House was fantastic this year, from the office team to housekeeping and maintenance, to the security team and our exceptional concierge, all of whom were very prompt and professional in responding to all of our needs! Everyone made us feel so at home, and treated us more like family than guests! We will miss you all and you can count on us to be in touch when were ready to schedule our next vacation on the beautiful island paradise of Roatan! Again, our only complaint was the beds being very uncomfortable. Otherwise, we were very pleased with the property and Island House staff. As indicated before, wed stay at this property again if the beds/mattresses were replaced but regardless of where we stay, well return to Island House Realty for our rental needs when we return to Roatan! They are an absolutely exceptional realty company to deal with and each and every one of the staff we dealt with gets our 5-Star rating!! REPLY: Thank you, we'll be replacing the beds based on your review! UPDATE January 2019: Brand new beds have been delivered to the house for both bedrooms, Serta Perfect Sleepers and they are super comfortable! Nice ,friendly staff. Cleaning staff were great also! Enjoyable stay, could use a little updating, Boat House property straight across the lane was very, very nice for a lower price! I enjoy my time and have a relaxing experience REPLY: Thank you, we hope to have you back soon! Thank you for everything. The only thing I would suggest is to change the mattress on the sofa bed, it's very uncomfortable. They did change it for us during our stay, I recommend you change it for good, it's not even good for children. Thanks REPLY: We appreciate your suggestion with the bed, we have let the owners know and are looking into new options. The communications (emails) I received before our stay were excellent and really helped us prepare for our trip. Staff is best on the island, always prompt responding and always friendly. This is a beautiful 2 bed 2 bath apartment. It's well equipped, the bathrooms have just been remodeled, it has a lovely covered front porch and is only steps to the beach. The deck the home and everything about Lower Barefoot is impressive Brad Ruth Sam and Ryan all do a fabulous job to make your stay the best it can be We highly recommend this home !! Barefoot Dreams beach level is steps from the beach in a little enclave of rental homes on West Bay Beach. You will spend most of your time on the cozy porch, surrounded by Palms and other plants. The kitchen is well equipped, nice bathrooms (one ensuite), and a living, dining area. 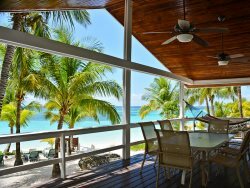 There is no better location in Roatan than West Bay Village and Barefoot Dreams is one of the 2 or 3 best properties in the village. We had an absolutely wonderful time. Can't say enough about how well organized your company is. It made the the vacation that much more carefree. Only slight negatives were the power issues(not your fault) and the loss of the internet. These issues were of such slight regard that they didn't impact the vacation at all. Overall, loved Roatan, loved our house, loved our beach and deck, loved the diving. Can't wait to come back........soon! Add $25 night for air conditioning.